A comfy, cozy winter doesn't have to break the bank or be an energy drain. These aren't big projects like adding attic insulation or replacing your windows—save those for later. They're easy-to-do and inexpensive techniques. The most complicated will take a weekend afternoon, and many take little time and don't even require the purchase of materials, only changing a habit or two. Others can be done for as little as $10. We'll take a look first at the obvious stuff and then at more specialized—but still simple—energy-saving techniques. If you're using a coil-type thermostat, you'll get more accurate readings if you clean it. Pop off the thermostat cover and blow or gently swipe away the dust. A programmable thermostat allows you to preset temperatures for different times of the day because you don't need to keep your home at 68 degrees around the clock. Although one shouldn't be used with heat pumps, a programmable thermostat is a real money-saver with air-conditioning as well as with heat. Choose a setting on the low end when you're sleeping or are away and go with a higher setting at other times (see table below) for savings of between 10 and 20 percent of your bill. Some units can store up to four temperature settings each day—e.g., morning, day, evening, night. All have a manual override switch. Models from Hunter Fan are typical. The Set & Save 5+2 lets you program one five-day stretch and a two-day period. With the Set & Save 5+1+1, you program one five-day stretch and two other separate days. The Set & Save 7-Day and 7-Day Energy Star models provide the most flexibility, with individual programs for all seven days. The units use AA batteries to maintain the display if the power goes off and to hold settings. An open fireplace damper lets the same amount of heated air escape up the chimney as a wide-open 48-inch window lets out. Make sure your flue is closed when you don't have a fire going. In fact, it is a good idea to reduce the number of times you use your fireplace. A roaring fire exhausts over 20,000 cubic feet of heated air per hour to the outside. Sure it feels warm by the fire, but every BTU that goes up the chimney is replaced by cold air pulled into the house elsewhere. And all that cold air has to be heated, a costly prospect. Can't resist a fire every few nights? Install a set of glass fireplace doors ($400 to $600). Closing these doors when you go to bed prevents large volumes of heated air in the living space from escaping after the fire has gone out. Ceiling fans are everywhere in warm-weather climates. Their spinning blades move air around the room, providing relief from summer heat. Not all energy experts feel it's a good idea to use ceiling fans in the heating season (doubters says they cool the air too much), but the fans do help bring heated air down to earth in rooms with cathedral or high-sloped ceilings. However, that's only if you slide the reversing switch on the side of the motor housing to the winter (clockwise) position. Then run the fan at its lowest speed. If you can't reverse the blade rotation or if you think the fan is cooling the room too much, leave it off. This sounds like a no-brainer, but many times a couch, chair, or bed moved during the summer stays there in winter, blocking the flow of heat into the room. This wastes money and leads to cold rooms. With a forced-air system, blocking a supply or return vent can cause a house-wide pressure imbalance that disrupts the heat flow in the whole system. Light a match and the rising hot air will draw nearby cooler air into the match flame. Heat a building, and the rising hot air will pull cold air from outside into the house. It's a physical principle called "stack effect." To defeat it, cut down on spaces cold air can enter your house, like under a door to the outside. Seal this gap with a "door snake," a long, thin cloth sack, like a bean bag. Fill it with dried peas or rice, something to make it heavy enough to stay in place. You can sew one using scrap fabrics. You can also keep the heat where it's needed by making sure some interior doors, such as those leading to hallways or near stairways, are kept shut. This closes off natural air passageways so they can't act as chimneys, allowing warm air to escape up through the house. Dead air is a very effective insulator, and you can create a pocket of it by installing clear plastic film across the inside of your windows. Available in kits that contain plastic film and double-sided tape, the plastic becomes nearly invisible when you heat it with a blow-dryer. If you find it unsightly, place the film on windows and patio doors selectively or only in unused rooms. Measure your window before buying; kits vary in size, and they work only with wood, aluminum and vinyl-clad molding. Payback is fast on this inexpensive technique, because heat lost through windows accounts for 10 to 25 percent of your overall heating bill. If you can rattle your windows, they're letting a lot of heat escape around the frames. Seal the open spaces with puttylike rope caulk before shrink wrapping. Press-in-place rope caulk ($5 per window) is mess-free and easy to use, and removing it in the spring is a cinch. But be sure to do a thorough window-sealing and caulking job before next heating season rolls around. If you feel cold air seeping beneath a door leading outside and find that using a door snake is inconvenient, install a draft-defeating nylon door sweep. This long, thin broomlike vinyl-and-pile attachment gets installed along the inside bottom edge of the door. Cut the sweep to fit with a hacksaw and keep it in place with four or five wood screws. If you heat the garage, check to see if cold air is infiltrating along the bottom edge of the door. Rubber garage-door gaskets, nailed in place with 1-inch galvanized roofing nails, can stop that cold air cold. Got drapes or curtains that block sunlight? Open them during the day to get free solar heat (make sure windows are clean). And then close the curtains just before sunset. Also, consider insulating curtains (around $100 per window). As a general rule, each square foot of window that you insulate at night saves about 1 gallon of oil or nearly 1.5 cubic feet of gas a year, which means that insulating curtains pay for themselves in around seven years, to say nothing of the added comfort. If you have a forced-air system, changing the furnace filter can save you some energy (up to 5 percent) and keep dust down in the house. The system will last longer and be less likely to break down. The most popular 16 x 20-inch duct filters cost around 50 cents each when bought by the box. Change them monthly during heating season. Measure your air filter before shopping; they range in size from 12 x 12 inches to 30 x 30 inches. An alternative to swapping out the replacement filter is to use washable filters (around $20 each). With care, they can last five years. You use more hot water in winter. Lower the water heater temperature from 140 degrees to 120 degrees. And take showers, not baths. According to the U.S. Department of Energy, the average bath consumes up to 25 gallons of hot water, while a five-minute shower uses up much less—only around 10 gallons. Equipping your showers with low-flow showerheads also dramatically reduces the consumption of water, both hot and cold. 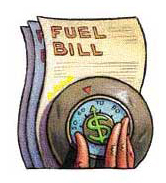 Rapid cycling—when a heating system fires on and off—wastes money. It occurs because of a heat-anticipation feature on thermostats that maintains a near-constant room temperature. Most electronic setback thermostats are programmed to act when they sense a 1 degree to 1.5 degree drop. If the thermostat is misprogrammed to less than 1 degree, the heater may go into rapid cycle, firing every three minutes or less to maintain temperature. To stop rapid cycling, make sure the "cycle-rate adjustment" in the thermostat setup mode reads from 1 degree to 1.5 degree. If you change it, move it higher. On most mechanical thermostats, the amperage scale is set from 0.1 to 1.2 amps. To defeat rapid cycling, set the arrow one notch higher. Let it cycle for 24 hours before adjusting it again. Rapid cycling is common in the relatively warm early and late winter, when you're using a unit capable of heating on the coldest days. Detect rapid cycling in midwinter, when the heater should fire 5 minutes on, 5 minutes off. Need more guidance on saving energy? An online publication called "Energy Savers" is available free from the U.S. Department of Energy. It features more than 100 easy and practical energy-saving tips.